This morning as I went to pull out a random journal, I intentionally found the one from the beginning of the year. I was on a quest to unravel my motive for my “One Word” that I chose eight months ago. My word is . . . I wanted to choose “want,” but it seemed too grabby and selfish. 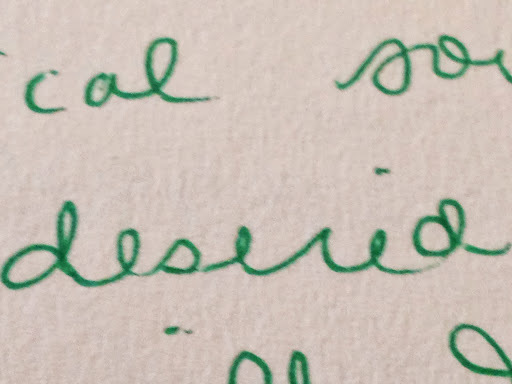 So, I went with desire, which rolls off the tongue with ease and grandeur. Where has this one word taken me this year? Back to the heart of God over and over again. Why? Because my desires and His desires are not always in sync. I become confused and easily entangled by the desires clawing at me through every medium possible. My phone, the internet, magazines, TV shows and movies, songs on the radio. Books piled around my house beckoning me to read them. So many distractions and choices. Some of the choices and distractions are benign, and even good like spending time with friends. However to stay focused on the “race marked out for me,” I often have to say no to good things. My work is to write words. God has made that clear to me several times. And I want to live a writing life. I love journals and discovery collage and sketching because all of these activities feed my created soul and fuel my writing endeavors. My desire for writing words is to encourage others to discover their created self. To offer words to feed your soul and dare you to embark on your path and persevere in your race. May God unravel those places in your soul that need to breathe, to be expressed and to be scribed or scribbled down on some piece of paper. Your journaling technique is yours alone. I am just sharing mine so you can see that it is possible to explore, enjoy and embrace your created self! For a treat to myself, I created a journal collaged with magazine pictures and white space for writing and sketching. This journal began during Advent 2012 and goes through the month of January 2013. I prefer raveled–untouched, kept together–if I read will I get tangled or untangled or mired into deeper questions of quest and conquest? no thread to pull to wreck the image– a wrecked image, a ruined reputation-who the hell cares? I care. you care. he cares. she cares. we all care–but I want to live a carefree life! A journal is a safe place to vent, a real place to reach into uncensored parts of ourselves. It is vulnerable to share these musings here, but I hope this glimpse into my raveled self, unravels in you a desire to find your own safe place to write and express what is inside you. Journaling, for me is a form of prayer, a dialogue between my created self and our Creator God. What draws you to journaling? You have a good analysis of what we do when we blog and when we interact with others. I like what you said when you wrote of untouched emotions. 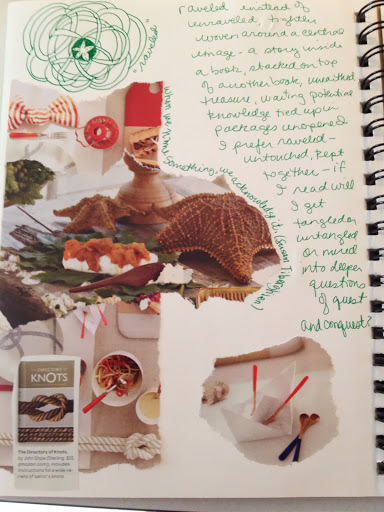 Oh, I love this my friend- – thank you for sharing so well, the many possibilities for journaling. I love to collage and save snippets along the way. And isn't it wonderful letting those words unravel themselves, fall out and be freed? Love! Kel, I love this post, because it exudes your passion, creativity, insight, and lovely words and art! Wow, a win-win. I find your random entry most serendipitous, because yesterday (without knowing anything about the Random Journal Day–which BTW, I LOVE! ), I RANDOMLY opened an old art journal and was captivated by magazine images I'd cut, torn, and pasted, and the words I'd written around them. Would there be any way to post it here, with your permission, and also if Sheridan could photograph it? No big deal if not, but I just thought it would be easier to see than to visualize. ANYWAY, when you wrote about raveled and unraveled, I'll admit that I have NEVER considered that there is a word, "ravel." Well, duh! If something becomes unraveled, it must have been raveled in the first place, but I'd never thought about it. And generally, I guess, unravel has had a negative connotation for me–like I'm coming unraveled. I'm coming unglued! …. that kind of thing. 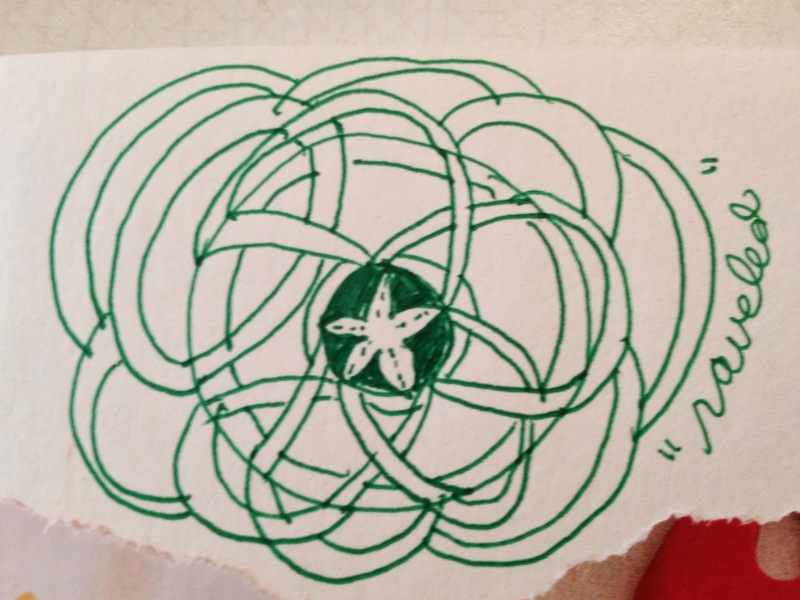 Actually, as you use it, unraveling is a good thing…..untangling. When your blessing for us is for God to unravel places that need to breathe, I immediately thought of the two pages in my art-collage journal, which are starkly juxtaposed. Dawn- I was so encouraged by your post this month at RJD and also for those who linked up and encouraged faith and trust as we were vulnerable with out journals. Lynni- So glad you can connect with Dawn here…and other kindred spirits!